Ryerson University exhibition celebrates the true story behind Winnie the Pooh with Lt. Harry Colebourn's photographs, diaries and artifacts from the First World War. Canadians can delve into the true story behind Winnie the Pooh and the Canadian connection to the classic children's stories at a new exhibition opening Wednesday in Toronto. Remembering The Real Winnie is being hosted by Ryerson University. It showcases photographs, diaries, letters and artifacts relating to Lt. Harry Colebourn, the Canadian veterinarian and soldier who first adopted the black bear cub that inspired the iconic franchise. This 1914 gelatin silver print, taken by an unknown photographer, shows Lt. Harry Colebourn feeding Winnie in Salisbury Plain, England. (The Colebourn Family Archive)A century ago this summer, Lt.​ Colebourn purchased the orphaned bear from a White River Ont. hunter for $20. Weeks later he was shipped out to Europe in the early days of the First World War. 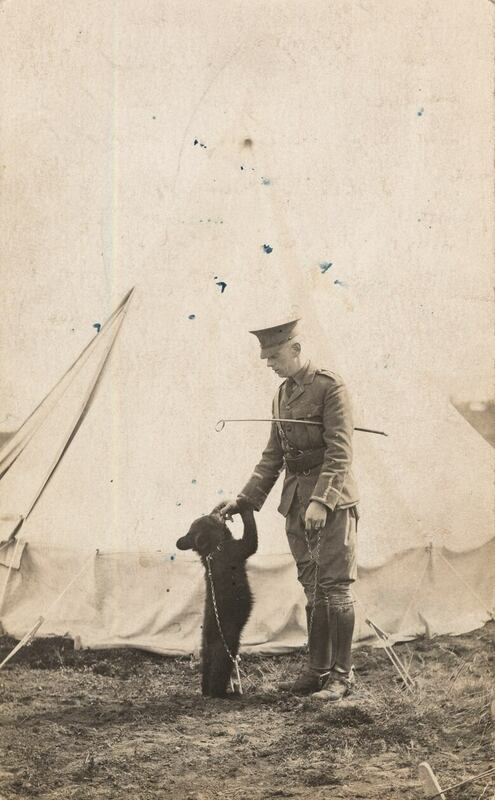 Colebourn took the cub (named Winnie after his hometown of Winnipeg) with him to England where it became the unofficial mascot for Colebourn's unit, the 2nd Canadian Infantry Brigade​. When it was time to fight in France, Colebourn loaned his beloved pet to the London Zoo where it caught the eye of A.A. Milne and his son, Christopher Robin. Winnie became the inspiration for the book Winnie the Pooh, which has since been published in more than 45 languages and has sold more than 20 million copies worldwide. The central feature of the exhibition is Colebourn's never-before-displayed wartime diaries from The Colebourn Family's archives. It traces Colebourn's story from 1914 to 1919 when he permanently donated Winnie to the London Zoo. The exhibition also coincides with a number of events marking the centenary of the First World War, including a recent U.K tour of remembrance by the National Arts Centre Orchestra. Colebourn's great granddaughter, children's book author Lindsay Mattick, also participated, tracing her great-grandfather's steps through Salisbury and to the London Zoo. Watch CBC's Nalah Ayed's report on the tour and its Winnie connections in the video above. Winnie's history will also be explored in an upcoming children's book by Mattick next year. "My hope," said the author in a statement, "is that people will feel as inspired by the heart of this story as I have. "These resources serve as profound reminders that one can never truly know the impact that a small, loving gesture can have in this world." Remembering The Real Winnie will be on view at the Ryerson Image Centre until Dec. 7. Admission is free. Fans unable to make it to Toronto, can view an interactive online feature that makes the entire collection digitally accessible to the public.